You know, when you're saving the world it's the small things that matter. You've got to be sure you've got everything you need with you, like tape or warm outerwear. Who knows what your day in space will be like? One moment you could be traveling along, giving the Star-Lord a hard time and the next an asteroid field could send you and your buddies hurdling to a planet you know nothing about. How are you supposed to know what's on that planet? There could be carnivorous plants, the atmosphere could be poisonous, or, worse, it could be a bit chilly and damp. As boy scouts and superheroes know, the key to success, or in some cases survival, is always be prepared. So when Gamora lands on that unknown planet she's not going to shrink into the ruins of the ship, frantically calling for help. Oh no, she'll be ready to head out and calibrate what needs to be done. Someone's got to do it and everyone else is probably too busy arguing, looking at you Rocket. 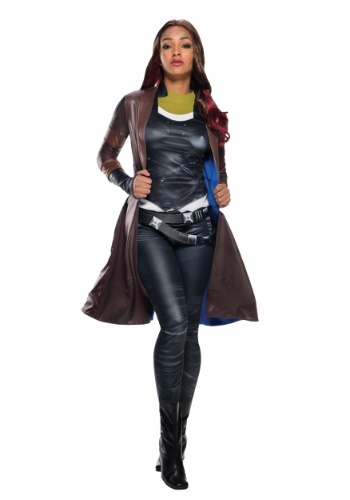 A brisk breeze and cold rain won't slow Gamora down when she's solving the problems of the universe, especially if she's wearing this chic yet functional jacket. It's thin enough to pack away in a small space craft but it's leather (or in this case pleather) so it at once repels any alien bites, stops the rain from soaking through, and makes sure Gamora stays nice and toasty.